This results in the partners lashing out at each other. They act out their feelings instead of communicating about what is happening for them in a way that is respectful and promotes connection rather than disconnection. This behavior increases the disrespect and disconnection between partners. What might you be doing in your relationship that is discouraging connection rather than bridging the connection and building intimacy? How would things be different if you used the same energy your are using right now, to build distance in your relationship to instead identify what these things are and change them to positive, relationship building techniques? What about learning to communicate your thoughts and feelings skillfully, rather than avoiding your partner? What about starting to engage in activities or behaviors that sustain the relationship and are more pleasurable for both of you? Often avoidant behaviors and/or conflicts in relationship occur because one or both partners struggle with the skill of being yourself and expressing yourself respectfully in the relationship in the face of conflict, disagreement or feelings of fear and anxiety. It is a crucial skill that each partner needs to develop so they can manage their own emotions, even when their partner cannot. Couples therapy can help you develop skills to work through relationship issues. Marriage counseling may help you build the intimacy you and your partner are hoping for. 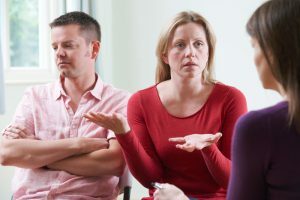 A qualified marriage therapist may be the support your relationship needs to grow and move forward.